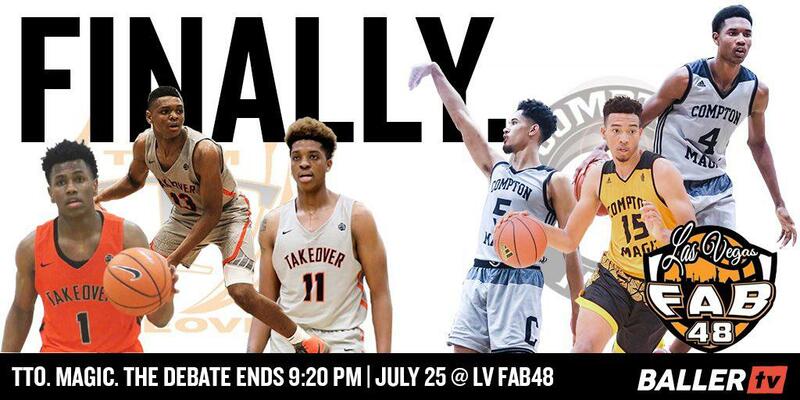 It’s not often we get to see the best from two circuits square off, but this year at the Las Vegas Fab 48, that’s exactly what we’ll get. Late Wednesday evening, the Nike EYBL Peach Jam champion Team Takeover (DC) will go head-to-head with the adidas Gauntlet Champion Compton Magic (CA). The debate between the three sneaker circuits is never ending, and this is a rare glimpse of the top programs from two of them going at it. Prep Circuit takes a dive into each of these teams and what to expect from this matchup. One word comes to mind when talking about Takeover’s one loss season; chemistry. From the starting five to the last player on the bench, every member of Team Takeover is on the same page. They play remarkable defense, run their sets on offense to perfection and put the team before themselves. Another attribute that stands out about Takeover is how balanced they are. They feature 13 players on their roster, and all of them will be playing Division 1 basketball. Their top seven rotation players are ranked in 247 Sports Top 100 - most of any team in grassroots. Takeover is gifted with elite guard play, as their backcourt is led by Villanova commit Justin Moore, Virginia commit Casey Morsell, four-star rising senior Anthony Harris and five-star sophomore guard Jeremy Roach. We can’t forget the big men, as top notch prospects Armando Bacot and Hunter Dickinson lead Takeover's frontcourt. Bacot was named MVP of the Peach Jam after averaging a double-double throughout the five-day tournament. Takeover can attack the opposition in so many ways with their versatility and unselfishness. The final elite attribute regarding Team Takeover is their discipline. Head coach Keith Stevens is the only coach to lead a team to two Peach Jam Championships in the EYBL era, and a win over Compton might make this his best team ever. Stevens’ ability to lead young men in undeniable, and it resulted in him being named 2018 NIKE EYBL Coach of the Year. Each and every year, Stevens’ instills a ridiculous amount of confidence in his players, which has formed Takeover into one of the biggest powerhouses in grassroots basketball. Compton has an elite frontcourt (detailed below), but grassroots basketball usually comes down to backcourt play. Moore, Roach, Harris & Young are super-composed and really, really hard to contain when they are clicking. Another year, another year the Compton Magic wins the Adidas Gauntlet Championship. Director Etop Udo-Ema has built one of the greatest dynasties in grassroots basketball, and this version is widely-regarded as one of the best ever. The Magic put together a memorable spring and summer. It wasn’t easy, as they went to double overtime with D1 Minnesota in the Gauntlet finals before taking a 87-83 narrow victory. They kept up their winning ways at the Summer Championships, going 7-1 en route to a 1-point championship win championship win over MASS Rivals. Their two losses on the season, to the LV Knicks and Team Carroll, came by a combined four points. Like Team Takeover, the Compton Magic have a great deal of chemistry, as some of their players have been playing together since middle school. Simply put, their frontcourt is dominant. Highly-ranked rospects Isaiah Mobley, Evan Mobley and Onyeka Okongwu are very hard to contain in the middle, and they come at you in waves. All three have have athleticism for days, and they are quite skilled outside of their frontcourt capabilities. Isaiah Mobley, a top 20 junior and a verbal commitment to USC, leads the Magic in assists. Okongwu is their best scorer inside, while Evan does a little bit of everything for the Magic. Regardless of how their frontcourt performs, they will need big time play from their guards. Jonny Juzang and Jarod Lucas (Oregon State commit) are sharpshooters from the perimeter, while guards Jaylen Clark and Isaiah Hill both see big minutes. They will have their hands full with the Takeover backcourt, but they've shown to be more than productive enough to outplay anyone in the country on any given night. Lucas and Juzang hit a combined 35 three-pointers at the Summer Championships, and they'll need at least seven or eight between the two of them against Takeover. The Magic have a winning tradition and play with plenty of confidence, and they are here for a reason. They shouldn't approach this matchup any different from another Adidas Gauntlet matchup, but they need to be prepared for Takeover's relentless attack. One thing can be guaranteed; the Compton Magic will be ready to play come 9:45 PM PST tonight.